Business owners tend to call locksmiths when there is an emergency, such as a lockout or repairing a broken lock in the middle of the night due to a break in or attempted break in but there is great value in forming a business relationship with a local locksmith. Sandy Springs Commercial Locksmith & Keys want to help you keep your business safe. We provide many services that can help prevent problems before they occur in addition to our emergency services. Naturally, we also provide the usual 24 hour emergency services such as repairing broken locks, unlock services and replacing broken or lost keys. Your business’s security depends on the type of locks that you have. Is your lock hardware strong enough to keep your business safe? 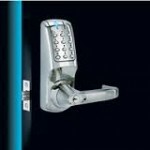 Sandy Springs Locksmith & Keys will come out and evaluate your current locks and if you would like to boost your security we can install additional locks or even upgrade your locks to high security locks to keep your business more secure. Our professional commercial locksmiths carry the equipment with them to be able to quickly install or rekey your new locks or replace your existing locks. Let us at Sandy Springs Locksmith & Keys help you make re-keying your locks quick and easy by installing a master key system. It is a recommended business practice to change the locks when any employee who has had access to your company keys leaves your employee. Sandy Springs Locksmith & Keys can install a master key system that makes rekeying your locks a snap; efficient and affordable.